Epic Movie Trailer Machine x 9000! You like teaser trailers, right? Like the latest ones for super-spy Jimmy Bandaids and The Men of Anchoring sequels? Well then you’re in luck, because I have one minute and three seconds of great news to kick off your weekend! There’s another blockbuster teaser trailer that just came out, and you’re seeing it here, first! Unless you saw it on my youtube, twitter, or facesbook first. Enjoy. Lyric videos are sweet, here’s a lyric video that I made found on the internet, using technology. You may be wondering: What makes this lyric video special — besides the fact that it’s one of the songs I sang background vocals on for the new House of Heroes album? Nothing. That is the only special thing about it. The album, called Cold. Hard. Want., by House of Heroes (feat. Dustin Heveron), releases July 10th. If Carson Daly were still a thing, he would say that the album “drops” on July 10th, to try and sound hip/relevant. Then he’d say some snappy one-liner about the album, something like “Hey, do you have any change I can borrow for cab fare?” Carson Daly had (and maybe still has, I haven’t checked) a talk show on at 1:30 in the morning — its primary competition in that timeslot is the night’s second repeat showing of the Shake-Weight infomercial and a blue screen that plays the Emergency-Broadcast System beep on a nonstop loop. It’s an ideal show for people who fell asleep while Late Night with Jimmy Fallon was on and still haven’t woken up to change the channel, or people who’ve masturbated too furiously for their forearms to have enough strength left to operate their TV remote. People Magazine once praised it as “a show that is on television.” House of Heroes will be on tour this summer, you should go to their webbed-sites for more information, and buy their album when it comes out in July. If you want to buy only the tracks that have my BGVs on them, I don’t blame you, and I will post some sort of list on my webbing-site that tells you which ones have them. I’ll also call them and ask if they’ll release a version of the CD that only has tracks I sang background on, to save you the trouble of having to ask them yourself. Currently there are no plans for them to sell a T-shirt with my likeness on it. I read a blog post about 27 tips on how to make your blog more accessible to people, and it says you should end posts with a question to the reader. I’m not doing a very good job of following its advice so far. I struggled mightily with how to close this three part “series” on action, emotion and redemption, but I find that no closing seems to be suitable — no ending appropriately poignant enough. So in the wake of nothingness, I will just leave you with openness — with the honesty of what I’ve seen and felt — and pray that you are able to make something more of it than words on a screen. April 30th, 2012 would’ve been a boy named Deacon’s fourth birthday. I won’t profane Deacon’s memory or the depth of suffering his family has been through by trying to pretend that I can possibly understand, legitimately explain, or fully empathize with the horror of losing a child. I won’t blaspheme the sovereign love that God has for all of us by saying that it’s for “the best” or part of “his plan” to take the life of an almost-three-year-old — especially one who brought joy to so many. What I will say is that we, as a people, have been dealing with loss incorrectly for a long time, maybe forever. For years, loss — the loss of a job, or of a relationship, or of a dream, or of a loved one — has stirred up a reaction among people to try and marginalize the loss, or parade around an endless series of trite sayings and clichéd advice with the hopes of logic-ing away the hurt that the loss caused. This could not be further from helpful. Even of the truisms that are actually applicable to a situation, the last thing that anyone needs to hear in the midst of a new loss is how effective time will be for healing their wounds, or how many good things are going to be brought about from their circumstances. What people actually need in a time of loss, is just for you to be there with them, to suffer with them, to let them use and release misery for what it is — rather than try to coax them into behaving as if everything was all right. A few of my friends (including one of my best guy friends) have gone through some difficult breakups recently, and the thing consistently astounds me is how unwilling some of their other friends were to let them have their moment of misery. Most of them jumped right into some awful variant of the “more fish in the sea” line, when what they needed wasn’t advice — everyone knows, empirically, that breaking up with someone very rarely means that you will never date or love again — they needed someone to buy them a beer or a coffee and just let them work through how awful it is to lose someone you care about. Later, in a different season, there is a time for encouragement toward joy and the reminder that there is a difference between acknowledging grief and wallowing in it, but in the heat of the recent wound, all that person needs from you as a friend is just a place where they can feel safe and vulnerable to react how they need to react. What gave me strength as Deacon’s father, mother, and sister worked through the sort of loss that no words can adequately describe, was that they remained real. They were honest, they were raw, they were hurt. They didn’t try to cover up pain with something false. They didn’t shy away from their need for people and support. Deacon’s father (one of the pastors at the church-plant where I serve) let himself be vulnerable to our community, and shared openly about how his relationship to and with the church was a pillar of support for him and his family. There were good days, bad days, unbearable days…but through it all, their aim was never to overcome or ignore the massive hurt and loss, but to battle through and lean on others even as they were leaned on by others. To use Christ as the compass, people as the oars, and press onward through the sea of troubles so accurately titled by Shakespeare centuries ago. 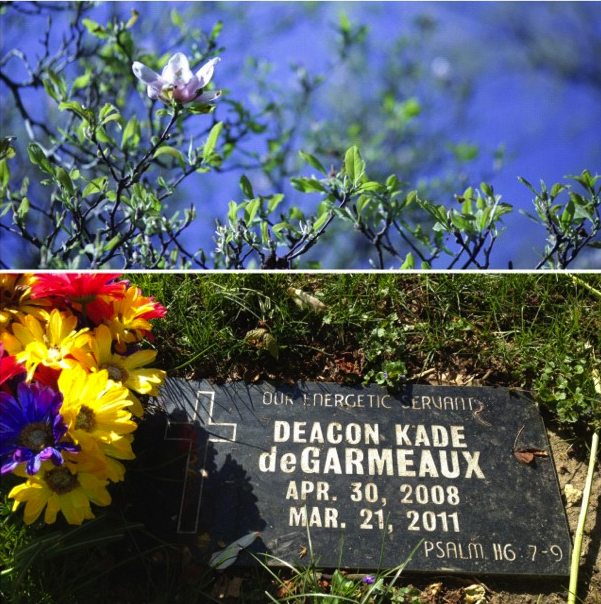 A year later, I know Deacon’s family still struggles with the immeasurable hardship of losing a son — I know this because I still struggle with it. The anniversary of his passing, the birthday that won’t be — can’t be — celebrated in the same way it would’ve, these are wounds that even the supposed cure-all of time can’t heal. But what I can proudly say is that Deacon’s family has been restored. Restored to joy, restored to life, restored through Christ. This isn’t to say that the scars of loss won’t always be there — it would be inhumanely callous to imply otherwise — but rather that their family’s perseverance toward gladness has produced an honest, open dialogue around the topic of deep loss in a way that was previously unavailable to many. And through that, there is joy. Not the joy that replaces an awful loss, but a joy that celebrates the memory of someone so wonderful that he spreads his energetic demeanor to others even after his departure. This is a restoration not born from man’s sheer will or blind/unfounded faith, but from the grace of our Maker mixed with the embracement of truth — even when that truth is pain. The restoration that comes when you use your gifts, right along with your pain, to help and heal others in the same way you let others help and heal you. My wish for — and request of — you is that when you experience loss (and if you haven’t yet, you will…such is the nature of our broken world) that you will let yourself first be vulnerable enough and strong enough to grieve. Don’t let anyone take that or talk that away from you. Jesus wept (John 11:35). He understood grief and pain and loss, and he understood the value of embracing them for a time. And the second part of my request is that you let yourself be restored. Not in the sense that you ignore the loss or the hurts of your life, but that you use such things to make yourself more fully attuned to your Purpose, and to the people you’re meant to effect. Be the energetic servant the world needs. Conquer loss, share restoration. Postscript: It’s my unbridled pleasure to mention by way of epilogue that Deacon’s parents are expecting once again, and will add a third child to their family by the end of the year. Rejoice.